Chilean conniving centenary behavior continues to damage Bolivian economy! Speaking to the press, the president of Bolivia’s exporters chamber, Wilfredo Rojo, and Gustavo Rivadeneira, the president of Bolivia’s heavy transport chamber, said that the move prevented the freedom of movement agreed between Bolivia and Chile in 1904. Rojo said that the strike prevented Bolivia from moving goods worth five million U.S. dollars a day to and from Chile. “Movement along this route reaches over 5 million U.S. dollars a day nationally. These are very high figures, which means the private sectors will lose markets…and the paralysis of the entire supply chain. It has always been complicated for Bolivia to depend on Chilean ports,” said the exporter. Chilean customs officials called an indefinite national strike on Wednesday, stating the government did not comply with agreements signed last year. It has left at least 850 Bolivian trucks with international cargo blocked at the border. “Until now, we have about 850 trucks. 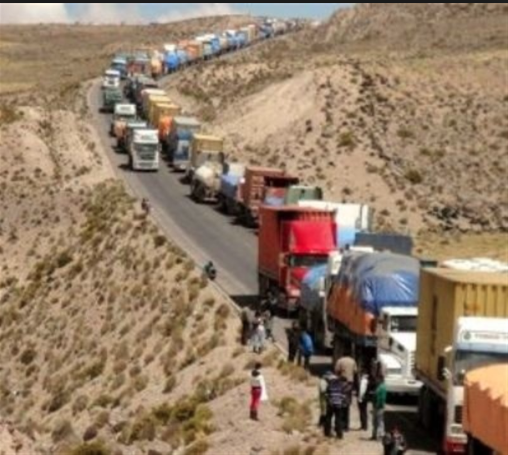 This is not an exact quantity, it could be more, as five trucks cross into Chile every hour,” added Rivadeneira. Last year, the Bolivian heavy transport sector lost around 15 million U.S. dollars due to Chilean customs strikes, without counting the losses for exporters and importers. Over the years, Chile attempted to irradiate an image to the world of being “civilized and developed” … nothing more distant to crude reality! Chile’s conniving centenary behavior towards Bolivian economy has never ceased to ruin us. Let’s not forget they invaded our territory, took all our sea-coast away from us; forced us into a “treaty” that allowed them to steal our water sources and control our commercial trade with the world. This entry was posted in Bolivia, Business, Economics, Social Unrest and tagged 1879 Pacific war, Chile, invasion, road blockades. Bookmark the permalink.